A photographic identification guide to the 280 bird species most commonly seen in Singapore. High quality photographs from Singapore’s top nature photographers are accompanied by detailed species descriptions which include nomenclature, size, distribution, habits and habitat. The user-friendly introduction covers geography and climate, vegetation, opportunities for naturalists and the main sites for viewing the listed species. 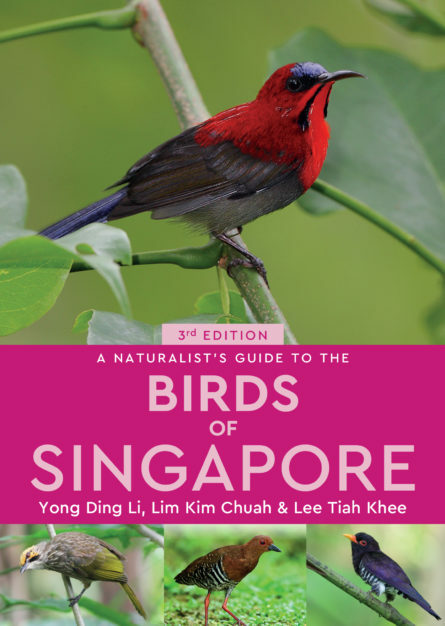 Also included is an all-important checklist of all of the birds of Singapore encompassing, for each species, its common and scientific name, IUCN status as at 2011. Yong Ding Li is vice-chair of the Southeast Asian Biodiversity Society and committee member of the Nature Society (Singapore)’s Bird Group. He is currently pursuing a PhD in biodiversity conservation at the Australian National University. Ding Li has extensive field experience in Singapore and across Asia, and has published many research papers on birds, conservation and ecology. He also advises the IUCN SSC on South-east Asian birds. Lim Kim Chuah is committee member of the Nature Society (Singapore)’s bird group and one of the most experienced birdwatchers in Singapore, with over 30 years of field experience in the country and across Asia. He has written many papers and books on Singapore’s bird fauna. Lead photographer Lee Tiah Khee is a professional with over 25 years of experience. He is one of Singapore’s top nature photographers and has won numerous accolades, including the Singapore International Photography award and the prestigious Young Artist Award in Photography in 1992. His works has been published in many magazines and books.